Low Water Perennial Herb Gardens in hot, dry climates. The following plants are low water, culinary perennials, often from the Mint family. Unless stated otherwise, they need full sun, very well drained, poor soil, no organic mulch, and once established for two years, no water except rain. Some plants, however, will look better with monthly water and gravel as mulch. Many do best in raised garden beds which provide better drainage. Most attract butterflies and bees and have ornamental cultivars. Edible plants, of course, must NOT be treated with pesticides. Fennel is a short-lived perennial herb in the Celery family. Having yellow flowers and feathery leaves, Fennel can grow to 6' tall. Bronze Fennel is often considered a decorative version of Fennel, but has the same flavor and is more drought tolerant. The yellow flowers, leaves, stems and seeds are used in cooking. Fennel is also a food plant for the Black Swallowtail and Anise Swallowtail butterfly caterpillars. Avoid planting near Dill, because they cross easily with poor results. This plant does better in slightly acidic, sandy, dry soil. USDA hardiness zone: 3-10. Crimson Bottlebrush - Callistemon citrinus. An evergreen shrub and member of the Myrtle family. Cuban Oregano - Plectranthus amboinicus. A perennial herb and member of the Mint family. Elephant Food - Portulacaria afra. A succulent perennial shrub and member of the Porkbush family. An herbaceous perennial with a bulb growing from a rhizome. It has solid, flat leaves, rather than the hollow leaves of most of its Onion family relatives. The leaves can be cooked, or eaten raw, imparting a mild flavor between garlic and chives. They are often used as a dumpling filler, to flavor seafood dishes, and more. The unopened flowers are edible, raw or cooked, and used as a green onion substitute. The fibrous bulbs, while edible, are rarely used. An oil is extracted from the seeds. Once established, it can be cut to ground for harvesting and regrows quickly. It is invasive in moist conditions, so locate away from anything needing moist soil and do not mulch. It does better in slightly acidic to neutral soil. USDA hardiness zone: 4-9, depending on cultivar. 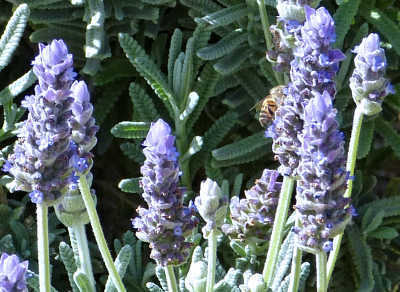 A perennial herb and member of the Mint family, Lavandula angustifolia has uses beyond the medicinal. The fresh flower buds, when boiled, can be used as a flavoring component in limeade or to make tea. They can also be frozen in ice cubes for drinks, and can be used as a marinade component for chicken or lamb. Dried, ground flower buds can be mixed with sugar to make cookies. Once established, Lavender will need water only once or twice a month. Do not overwater and do not place near other plants that need more frequent water. It does best in neutral to alkaline soil. USDA hardiness zone: 5b-9, depending on cultivar. A perennial subshrub and member of the Mint family. A deciduous shrub and member of the Verbena family. A perennial herb and member of the Aster family. A perennial herb and member of the Mint family, Oregano does better in neutral to alkaline soil. USDA hardiness zone: 5-9. A perennial shrub and member of the Mint family, Rosemary does better in slightly alkaline soil. Difficult to transplant and usually propagated by cuttings, it is extremely hardy once established and thrives on neglect. USDA hardiness zone: 7-10. An evergreen shrub and member of the Citrus family, its leaves and berries are used sparingly in cooking in some European countries and in Ethiopia. Toxic and bitter in large amounts, it is employed as a garden border shrub to keep insects, rabbits, dogs and cats away. It also serves as a caterpillar food plant to the Giant Swallowtail and Black Swallowtail butterflies. Some people develop a photosensitive skin allergy in contact with the plant, so handle with care. It tends to inhibit the growth of other nearby plants (allelopathic) and is sometimes restricted to large containers for that reason. It grows best in neutral to alkaline soil. USDA hardiness zone: 4-10. An evergreen shrub, and member of the Mint family, Sage was once considered one of the essential herbs along with parsley, (sage), rosemary and thyme (remember the song?) The flowers are also edible. It tolerates acidic to moderately alkaline soil and does best in slightly acidic soil. USDA hardiness zone: 5-10. An evergreen shrub, and member of the Mint family. A perennial deciduous herb, and member of the Mint family. A perennial herb, and member of the Rose family, Salad Burnet has naturalized (grown wild) in most of the United States. The young leaves and shoots, best picked before the plant comes into flower, are used in salads, soups, cooling drinks and to flavor wine in claret cups. Avoid harvesting in the hottest part of the year when it is most bitter. In alkaline soil it has a mild, cucumber flavor, while in acidic soil it is said to have a bitter taste. Once established, it can be watered monthly to weekly depending on taste preferences. USDA hardiness zone: 4-8. Low growing, evergreen shrubs and members of the Mint family. An evergreen shrub, and member of the Mint family, Winter Savory has a peppery, savory flavor used with beans, meats, vegetables, vinegars, stuffing and tea. Summer Savory, a close relative, is an annual with a milder, sweeter flavor. Winter Savory does better in neutral to slightly alkaline soil. USDA hardiness zone: 5-11. A high water herb, such as mint, can be placed in a 6" pot with bottom holes which is then buried to the rim in a raised garden bed. The pot will keep moisture next to the roots and prevent it from being leeched away by the surrounding dryer soil. The bottom holes release excess water and allow roots to go deeper into the soil for buried moisture. The buried sides keep the sun from warming the pot and increasing evaporation. Mint plants planted like this in spring, and watered once a day, have survived winter without being watered at all in USDA zone 8b.